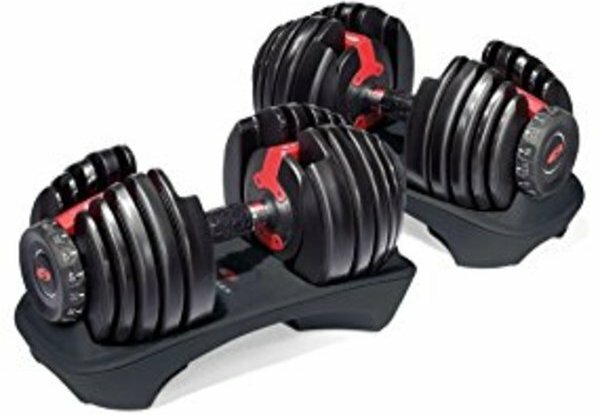 Bowflex SelectTech 552 Adjustable Dumbbell Set! My brother recently ordered the Bowflex SelectTech 552 Adjustable Dumbbell Set. In no time they have become a favorite addition to his home gym, and for good reason! First of all, these two dumbbells replace 30 other dumbbells, saving a huge amount of space. This is great for him because he doesn’t have the room for a full dumbbell set. Add to that just how simple they are to use. Allowing you to choose a variety of weight, from 5 and 52.5 pounds per dumbbell, with just a quick turn of the dial. It really is that easy! Another thing that I think is great! The SelectTech 552 dumbbells adjust in 2.5-pound increments for the first 25 pounds. This flexibility makes them perfect for everyone! What I Liked About The Bowflex SelectTech 552! Okay so you already heard a few of the benefits of the Bowflex SelectTech 552 Adjustable Dumbbell Set. They take the place of 30 other dumbbells, they are compact, and they have a wide range of weight settings. Those are all incredible benefits of these dumbbells. Add to that a few more amazing benefits I would like to point out for you. First with such flexibility in terms of weight settings. The Bowflex SelectTech 552 Dumbbells become very versatile. There are a ton of different exercises you can preform with just these two dumbbells. However, this is what impressed me the most, they are Very Well Built! If you have ever used a knock off set of adjustable dumbbells. Then you already know that far to often the weights shift around. Even the slightest shift in the weight can cause you to lose proper form. Not only is that annoying, it could lead to an injury if the weight shift happens at the wrong point of the exercise. You will not have that problem with these! I found that the Bowflex SelectTech 552 Dumbbells were very solid and I did not experience any movement by the weights. Major Plus In My Book! What I Did Not Like About The Bowflex SelectTech 552! To be honest, there is not much that I do not like about these dumbbells. However leave it to me to find something, after all that is why I am here. The biggest problem that I had with these dumbbells was the length. No matter the amount of weight you have set, the dumbbell is always the same length. Really no big deal, except that it can make preforming some exercises feel awkward at first. This doesn’t happen on a lot of exercises, but a few. It just takes a simple adjustment to fix, but worth mentioning. 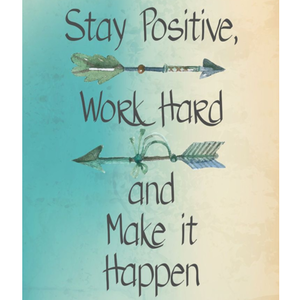 The next thing is really not a problem, however I see it done A Lot! If you are the kind of weight lifter that likes to drop the weights after a set. These dumbbells are not for you! The weights are covered in a plastic case, dropping these will definitely lead to that casing cracking and breaking. 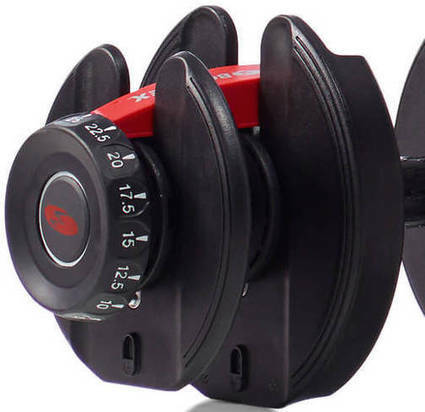 Also the locking system could be damaged or broken if these dumbbells are slammed around. While very well built, the Bowflex SelectTech 552’s are not meant to be dropped and thrown around. I know that that might seem silly to mention, but these are not the ole one piece dumbbell. I workout with my brother twice a week, and so far I am a fan of the Bowflex SelectTech 552 Adjustable Dumbbell Set. Personally I think they are well worth the money. *Check Out This Short Video About The Bowflex SelectTech 552’s! Here is glimpse of just a fraction of the exercises you can preform with these dumbbells! 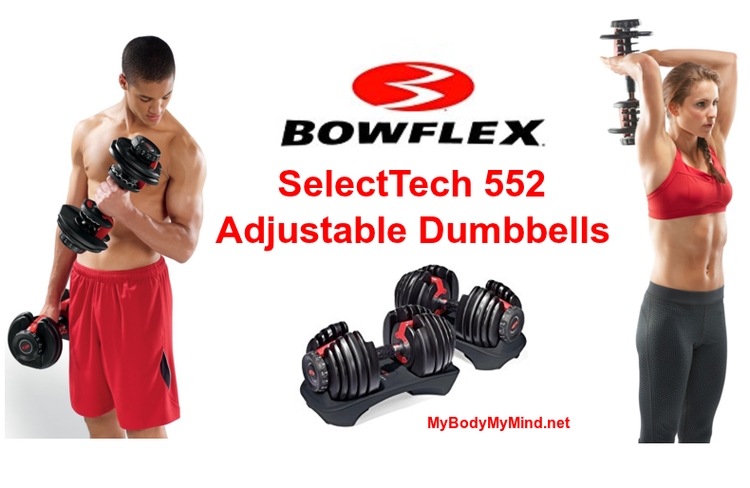 Bowflex Selecttech 552 Dumbbell Sale! Okay, Okay, I can not really tell you this is a sale. But what I can tell is that I have checked seven other retail vendors including the Bowflex website. All seven vendors had the Bowflex SelectTech 552 Adjustable Dumbbell Set listed for $299. However when I checked Amazon they had them listed at only $259, that is $40 less than the rest! The best part is that you still get the exact same product. The quality of Bowflex and the 2 Year Manufacturers Warranty. You get it all and save $40 at the same time! Look a full set of 30 quality dumbbells can run you well over $800 for just the weights. Then you need the rack, adding to the cost. If you want to build a home gym, already have a home gym, or just limited on space. The Bowflex SelectTech 552 Adjustable Dumbbell Set is exactly want you need! If you are in the market for adjustable dumbbells, you need not go any further! Don’t waste any more time, click the blue button below and get started with your Bowflex SelectTech 552 Adjustable Dumbbell Set today! I would like to take a second and Thank You for stopping by! If you have any questions or comments about the Bowflex SelectTech 552 Adjustable Dumbbell Set please leave them in the comment box below. If you prefer you can contact me directly through email and I will get back to you as soon as possible. Previous Post Previous post: The 2 Week Diet Plan Review – Guaranteed Results! 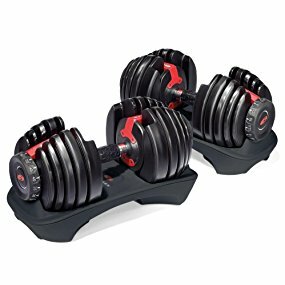 Next Post Next post: Bowflex SelectTech 1090 Adjustable Dumbbells – Get 30% OFF Today! I love the Bowflex Select Tech Dumbbells! My favorite part is that you can go from workout to workout quickly and cleanly. My only concern is that they are bulky with the lighter weights. Do you know if there is a stand for them? Mine are on the floor and I could use to elevate them. I am with you, it is very easy to move from one workout to the next withe the Bowflex Select Tech 552 Dumbbells. This makes for a much more efficient workout and more time for the other things our daily lives bring us. Jason there is a stand available that works well for 552 and 1090 SelectTech Dumbells. If you would like to check it out just click this link: Bowflex SelectTech Dumbbell Stand. Jason I will be writing a review of this stand and other great SelecTech accessories , please watch for them as these items add to the user experience of the SelecTech lineup. Thank you for making this review; I love lifting weights and I glad that I know more about Bowflex. It seems very long, so I can’t really lift straight curls as well. But, I love how I can increase the weight by 2.5 pounds up to 25 pounds because that will help me increase the weight consistently! I might get one for Christmas, so I’ll come back soon and I hope to see what you write next! You are correct, these dumbbells are a bit long. However with a few minor adjustments you can still preform all most every exercise you can think of! The ability to increase weight by 2.5 pounds makes them very versatile for many upper body movements. Then you can easily go to the higher weights for things like lunges and dumbbell squats. That is one of my favorite things about the Bowflex SelectTech Adjustable Dumbbells, just how many uses there are. Marques you still have time, if you order by the 17th you can still get them delivered by Christmas! I really think that once yu have adjusted to the length, you will come to love the dumbbells as much as I have! I am glad you enjoyed the article, and I think you will love the Bowflex SelectTech 552’s. They really are a great addition to any home gym! Since using them I can even imagine not having them. They save a ton of room and are very versatile in use. I liked the 552’s so much I even grabbed the 1090’s, which are the heavier set. Evan please let me know what you think when you get your set! I have always liked the concept of adjustable dumbbells but don’t know much about weight lifting. The last time I used weights was in middle school around 20 years ago. I have started following a Paleo Diet and am following Robb Wollf’s Lifeline program which has you doing squats pushups and body rows. He then has you start using dumb bells. I really like the Bow Flex Brand but the 250 price tag is to expensive right now. Do you have any other recommendations for someone starting out that helps you maintain good form? I know that $250 can seem like a lot of money. However you have to consider the fact that you are getting over 30 dumbbells in one set of two. I can not think of any dumbbell set that can match that. Not even the cheapest set I have found does not offer that kind of selection for that price. My suggestion would be to save up a little longer and grab a set when you can. The other option is to grab a few pairs of dedicated weight dumbbells that would fit your most needed exercises and build your collection from there. But even that route is going to add up pretty quickly. Before I began to use the Bowflex SelectTech dumbbells I had a pair of 15 pound and 25 pound dumbbells. They worked for many exercises, but I quickly out grew them and found myself needing more weight. Each person has a different set of circumstances, so use your own judgement. But if it were I, I would hold off until I had saved enough to grab the set that served the most uses.